How will this playbook help me and my business? Digital transformation projects are complex. It's inevitable since there are now so many different potential marketing activities across different paid, owned and earned media touch points which can be improved through digital transformation. Changes to improve internal processes, team structures and skills, technology, data management, insight and reporting will all also be required. For larger organisations, they are often more complex still, since more teams and functions need to be involved. 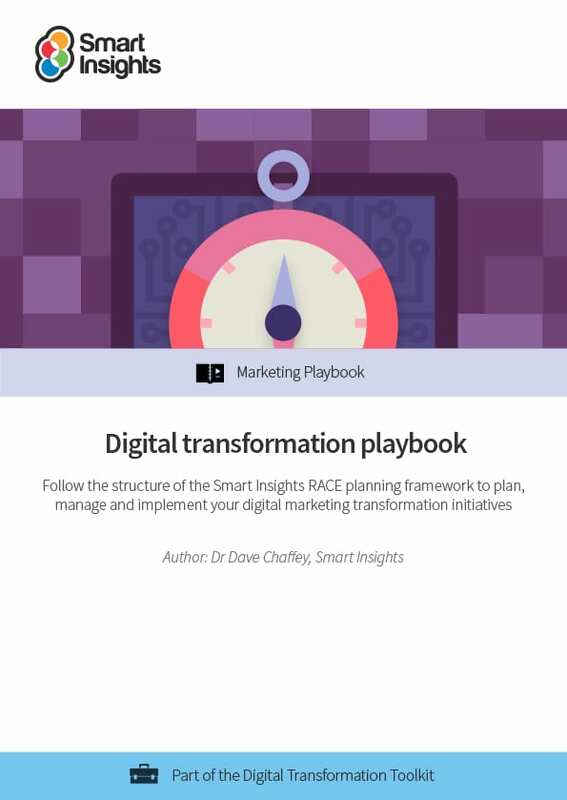 This playbook will provide you and your business with a comprehensive structure to follow, which will help you plan and prioritize transformation activities across different marketing communications in the customer lifecycle using the Smart Insights RACE planning framework. For the maximum impact, revised omnichannel communications need to be integrated across web, mobile, email and traditional platforms, plus in-store/phone-based communications, if relevant. Potential opportunities from updating revenue and business model may also need to be considered. How is the playbook structured? 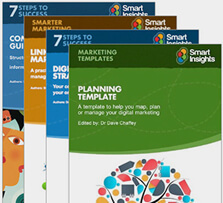 To provide a comprehensive coverage of all marketing activities, this guide is based on the Smart Insights RACE planning framework. Activities covered include the full customer lifecycle or marketing funnel from Plan > Reach > InterAct > Convert > Engage an audience. For this Playbook, the framework is broken down into 25 more detailed activities for you to review in a checklist format. For each of these 25 activities, we recommend specific actions to take with links to resources and tools giving more detailed advice on best practices. How does this playbook support transformation? The playbook provides a structured checklist of integrated digital communications activities that should to be reviewed and optimized to increase the digital contribution of leads and sales for a business. It links to more detailed templates to help you review and improve the effectiveness and efficiency of activities. Dave is co-founder and Content Director of Smart Insights and creator of the RACE planning framework. He is editor of the 180+ templates, ebooks and courses in the digital marketing resource library created by our team of 25+ digital marketing experts. Dave has worked as a digital strategist, consultant and trainer since 1997. Dave is author of 5 bestselling books on digital marketing including Digital Marketing: Strategy, Implementation and Practice. In 2004 he was recognised by the Chartered Institute of Marketing as one of 50 marketing ‘gurus’ worldwide who have helped shape the future of marketing. For my full profile, or to connect on LinkedIn or other social networks, see the About Dave Chaffey profile page on Smart Insights. Business members get full access to this and 7 other guides in the Managing digital marketing transformation Toolkit.